Culms triquetrous, smooth or scabrous above, 15–50 cm high, 0.6–1 mm diam. Leaves not septate-nodulose, shorter than culms, 1.4–2.2 mm wide. Inflorescence of 1–10 spikelets in loose digitate clusters to 10 mm diam. on up to 4 branches to 3 cm long, or head-like; involucral bracts leaf-like, the lowest erect, exceeding inflorescence. 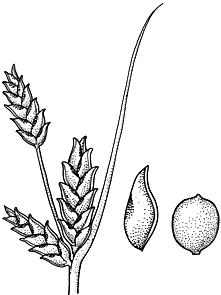 Spikelets flattened, solitary, or 2–5(-10) per cluster, to 13 mm long, c. 2 mm wide, 8–22-flowered; rachilla not or scarcely winged, persistent. Glumes excurved-mucronate, with sides nerveless or faintly 1-nerved, 1.5–1.7 mm long, greenish to straw-coloured, often tinged brown. Stamens 3. Style 3-fid. Nut trigonous, ellipsoid to obovoid, about three-fifths the length of glume, 0.8–1.0 mm long, 0.7–0.8 mm diam., pale to dark brown. Distribution and occurrence: Grows in moist, rather shady situations; north from Eden.